Cash out cell phones you no longer use. Don't leave your old cell phone in a drawer after an upgrade. Sell your old cell phone to PaceButler. Are you looking for a company that pays cash for cell phones? Well, you've found us. Pacebutler Corporation of Oklahoma City, Oklahoma will pay as much as $300 for each used cell phone unit that you ship to us, depending on the model and quality of your used mobile phones. Of course, we will also pay for the shipping. We've made it our job here at Pacebutler to help protect the environment through proper and responsible disposal of used cell phones while providing our customers with the the fairest valuation, in terms of cash for cell phones. You see, these old mobile phones can potentially become a danger to people's health and to the environment when they're trashed and deposited in our landfills. Chemicals and heavy metals found in the casing and batteries of mobile devices, like brominated flame retardants (BFR), mercury, cadmium, etc. are not biodegradable and will persist for a very long time. At some point, these substances will leak into the nearby soil and water ways triggering adverse effects on our health and polluting our environment. It's extremely important, therefore, that these old electronic items are disposed of properly, through recycling or reuse. How do we set prices for your old cellular phones? As mentioned above, the factors for valuation are the brand, model, and overall quality of the unit. To give you an exact idea of how much cash for cell phones we're paying on specific models, you might want to check out our Purchase Price List page. We provide free shipping for your mobile devices through Fedex and the US Postal Service, you can request for and printout the free shipping label, whichever shipper works best for you. After sending the phones to us, you can expect your check in the mail in a few days - we normally issue checks within 2 business after we've received the phones. The process, by design, is quite simple and convenient. Recycling, reusing, or disposing of old cellular phones properly and responsibly is a big step in helping protect our environment. Getting cash for cell phones and clearing the electronic clutter in your home may just be additional incentives to you. In times of great financial difficulty, however, earning a few hundred dollars in extra cash from old cell phones that, in all likelihood, you'll never use again, while helping save the planet, is always a good thing. Sell your used phones, today. It's the right call to make. 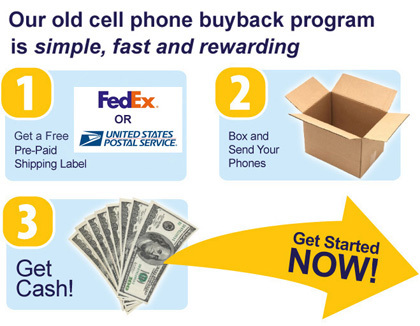 Have you heard of any company where you can sell your old and used cell phones and you get hard cash in return? Well, at PaceButler we do that for helping you dispose your cell phone and at the same time protecting the environment. The company processes and tests nearly 70000 cell phones every month. Around 20% of the phones are declared unusable and are recycled whereas for the rest of them, company pays thousands of dollars out to the customers for their discarded cell phones. After receiving your cell phone, we immediately start the processing and send you checks as early as 2 days. We even pay up to $300 for your old cell phones, which otherwise would have ended up gathering dust in cluttered drawers. Just follow three easy steps and you will be on your way to earning cash. You can also contribute cash to a charity by means of donating your used cell phones. So if you are really excited about earning some extra money by utilizing your discarded phones, its time to roll the dice- put the phones in a box with our pre-paid shipping label for shipping the phones to us. Do not miss checking our purchase price list before doing that and here you go...brace yourself up to receive cash for cell phones. "Thank you for the prompt turn around. I was a little skeptic of sending my 2 cell phones to a stranger, but as promised I had your check in 5 days. The amount was exactly what your web site promised. A very Satisfied Customer, Michael R."
"On behalf of the Board of Directors, volunteer and staff of the Juvenile Diabetes Research Foundation (JDRF), please accept my sincere thanks for your donation in support of The Vandevelde's and the Ride to Cure Diabetes. This contribution is greatly appreciated and will be used to support vital research aimed at finding a cure for diabetes."